The Encore Park Sculpture Wall is the first realized aspect of our commitment to our unique location at the crossroads of the past and present. As a nod to the Zig Zag Moderne style of 508 Park Avenue, Oldham and Coltrin chose to work with the hard angles of the Art Deco style made popular in the 1930s. This geometric style is well- suited to communicate the rugged determination of our community. This was a much-textured time for Dallas. 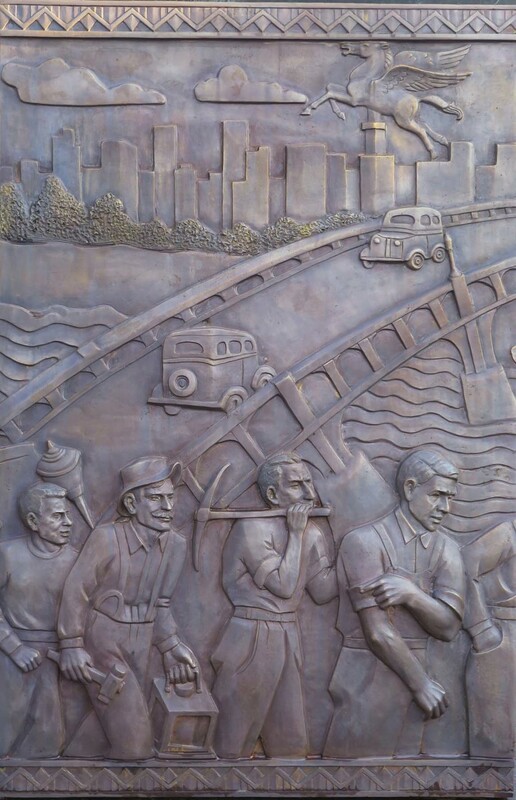 In their 1930s mural, artists Jerry Bywaters and Alexander Hogue depicted workers on the Trinity Viaduct. They represented the many people from different walks of life who came together to build this city. With the Sculpture Wall, Oldham and Coltrin bring this artwork back to life in a sculptural format while adding to the core of the story nearly eighty-five years later. They also depict Robert Johnson and the Light Crust Doughboys in the Sculpture Wall as a gesture to the more than 800 recordings that were made at 508 during the mid to late 1930s. On Young Street, five panels highlight iconic vignettes from “The Birth of a City”. An exciting day, when Oldham and Coltrin presented their vision for the Sculpture Wall to the Project Committee.